A group of dancers and singers from the China Ethnic Song and Dance Ensemble staged a fantastic performance in Auckland, New Zealand on Sept. 9., to unveil the "Experience China -- Culture Exploration of West China in Australia and New Zealand" event. With a history of more than 60 years, the China Ethnic Song and Dance Ensemble is the only national-level performance group representing the country's ethnic minority groups. It draws top artists from 37 ethnic minority groups including Mongolian, Hui, Zhuang, Tibetan and Uyghur people. At the opening ceremony attended by nearly 200 guests, Sun Zhijun, vice minister of the Publicity Department of the Central Committee of the Communist Party of China (CPC) said: "China is a unified country with various ethnic minority groups. Western China is where many of them live, and is known historically as the place where the ancient Silk Road was formed. The diversified culture of western China is one of the key components of Chinese culture. And songs and dances of ethnic minority groups are the most vivid reflection of this." 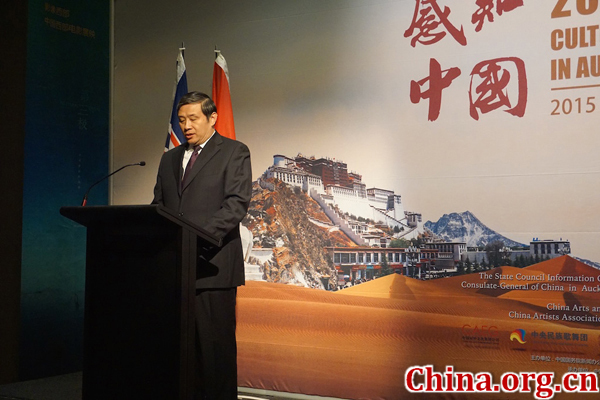 He said the event in Auckland aimed to allow people to experience the diversified Chinese culture so as to enhance the mutual understanding and friendship between the people of the two countries. Hon Todd McClay, associate minister of foreign affairs of New Zealand, who also attended the opening ceremony on behalf of the New Zealand government, said it was a wonderful opportunity for New Zealand to learn more about China, particularly to know more about its western region. "We have many people from New Zealand traveling to China for tourism, education and also for business, but a lot of the focus is on the eastern coast. Though I have had opportunities to visit on a number of occasions, it has never included western China, so I am very much looking forward to going there. As for tonight's show, I am grateful that China has decided to come and bless New Zealand with such an occasion to share culture. " The event, which will run to Sept. 18, is organized by China's State Council Information office and Chinese embassies and consulates in New Zealand and Australia as a special event to showcase and promote culture and landscape of western China to local residents. Besides the two-day folk song and dance show held in Auckland, a series of activities including a "Glamor of western China -- Thangka and Painting Exhibition" will be held in Sydney and Melbourne from Sept. 11 to Sept. 18. According to Lu Guangjin, director of the Human Right Affairs Bureau of the State Council Information Office, it is the first time for China to host culture exchange activities focusing on the culture of western China overseas. "Through hosting events like folk song and dance performances as well as the painting exhibition of ethnic minority groups, we can see how traditional Chinese culture and ethnic culture are passed on and protected. During the process of modernization, these things are very important to every country. China cherishes this culture and we will try our best to protect it." A group of dancers and singers from the China Ethnic Song and Dance Ensemble staged a fantastic performance in downtown Auckland, New Zealand, on Sept. 9.